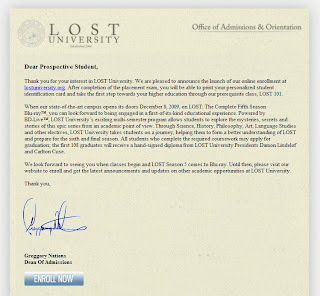 An email from Lost University has been sent out informing people that they can sign up, yes we know most of you already have but it does include a few interesting items. First it is sent by Greggory Nations who is a producer on many Lost episodes. Also it says "...the first 108 graduates will receive a hand-signed diploma from LOST University Presidents Damon Lindelof and Carlton Cuse"
If you haven't had the email you can see a copy of it by clicking here.